They say all roads lead to Rome but the Via Emilia doesn’t go there directly. Instead, it traverses Emilia-Romagna in a nearly straight line—from west to east—connecting with other roads that do. About three hours by car from end to end without stopping, it ‘s such a seductive way to explore the region that you’ll want to spend off-road as you can. While hordes of American tourists find their way to Veneto (to the north) and Toscana (to the south), the Via Emilia is a road less traveled. So you rarely encounter queues or have to worry about making dinner reservations. Yes, a little less English is spoken here but a surfeit of warmth, friendliness, and hospitality make up for it. My husband and I had visited Bologna, the capital city of Emilia-Romagna, several times before. The large, well-preserved historic center is a pedestrian zone that can be explored easily by foot. On this trip, however, we wanted to venture beyond the gates and miles of arcades. So ensconced in a rental care with a Hertz NeverLost navigation system in our rental car and carrying an IPad with Google Maps for backup, we set forth from Malpensa airport in Milan. Piacenza is about an hour and a half away from the airport. Starting there, we followed essentially the same route that the Romans took when the road was originally completed in 187 B.C. The Via Emilia (now a modern highway called SS9) spans a distance of about 165 miles between Piacenza, which sits beside the Po River halfway between Milan and Bologna, and Rimini on the Adriatic coast. Some of it is actually built atop the ruins of the original Roman road. 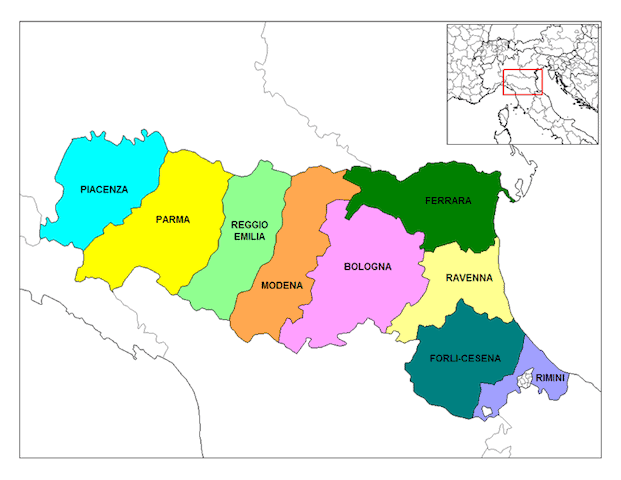 Blessed with a climate that is seemingly perfect for agriculture and farming, most Italians agree that the nine provinces of the Emilia-Romagna region comprise the gastronomic heart of Italy. Between strategically placed castles and fortresses are endless miles of farmlands covered with grapevines, olive groves, and citrus trees. On both sides of the road, we spotted cattle resting in the autumn sun. Parma is known for its foods, especially its extraordinary ham and cheese. Parmigiano-Reggiano cheese, the most famous and most imitated Italian cheese in the world, is only produced in the provinces of Parma, Reggio Emilia, Modena, Bologna and Mantua. You can see made in creameries and sample the famous Prosciutto di Parma (ham) where it is produced. Parma also has four unique food museums: the Parmigiano-Reggiano Museum in Soragna, the Parma Ham Museum in Langhirano, the Felini Salami Museum, and the Tomato Museum in Collecchio. Reggio Emilia is called the “tricolor city” because its flag later became the national flag of Italy. When it was created in 1797, it had red, green and white horizontal stripes with a coat of arms in its center. After the unification of Italy in 1848, the stripes were turned vertical. It is housed inside the town hall of Reggio Emilia, which was the first site of the Italian parliament. Modena is called the “land of motors” because it’s home to world-famous automakers, Ferrari, Maserati and De Tomaso. But it is also known for its sophisticated foods and traditional methods of producing balsamic vinegar. The vinegars produced here are obtained from grapes that are cooked, naturally fermented, and then aged in wooden barrels. Balsamic from Modena is so tasty that it’s even delicious as an ice cream topping! Ferrara, one of the first planned cities of the Renaissance, still has an intact medieval center. Built with red bricks, the Castello Estense was constructed for the Este family in 1385 and was linked to the family’s ducal palace. It is architecturally stunning, complete with a drawbridge and moat. From the Lion’s Tower, you can see a panoramic view of the city. Ravenna is known throughout the world for its well-preserved collection of Byzantine mosaics, and the city has eight monuments that have been designated UNESCO World Heritage sites. One of them, the orthogonal-shaped Basilica of San Vitale was founded in 540. Its simple exposed brick exterior belies an ornate interior with beautiful mosaics representative of the symbolism of early Christian art. Faenza is known throughout the word for its handcrafted ceramics (and now is also known as the place where countless turtle doves recently fell from the sky.) Specialized techniques developed here for glazing terracotta have been passed down for generations. The city houses the International Ceramics Museum and boasts more than 60 artisan workshops. The Bottega D’Arte Ceramica Gatti was founded in 1928. Called a “futurist ceramicist,” Ricardo Gatti’s work is internationally recognized; the shop features a salesroom, work area, and museum. Brisighella, a medieval town in the Lamone Valley known for its architecture, wines, olive oils, and moretto artichokes, is dominated by three hills. The D.O.C. wines made here come from sun-soaked Sangiovese, Terrano, and Trebbiano grapes. At a local wine and oil cooperative, Terra di Brisighella, you can taste the wines and oils and watch the locals “fill ‘er up’” at the self-serve pumps. Cesena offers several unforgettable gems: La Rocca is a pentagonal walled fortress built by the Malatesta family. One of its towers is used as a museum of agricultural history (depicting rural life in the area), and the other is a museum housing a collection of Malatestian ceramics. The picturesque Abbey of St. Maria del Monte is perched atop a hill that can be seen from most streets in the historic center; it is more than 1000 years old and has a priceless collection of small painted votive tablets (called ex-votos). Entering the Malatestiana Library, the oldest public library in Europe, is likely stepping back in time. The building, its furnishings, and its hand-transcribed books, remain virtually untouched since the 15th century. The charming medieval village of Sant’Agata Feltria is called the City of the Truffle because it’s the home of Italy’s National White Truffle Fair, held every October. Each Sunday in that month, the streets and squares are filled with the fragrance of white truffles as visitors sample and purchase specialty food products including truffles (in every paste, sauce, and form you can imagine), mushrooms, chestnuts, cheeses, wines, and honey. In a large tent, that seats 600 people, local restaurateurs serve affordable truffle dishes and wines. The port city of Rimini is probably best known as a summer tourist destination and the birthplace of director Federico Fellini but the history of Rimini goes back to the Etruscans. Its ancient town center with narrow streets is richly endowed with monuments. On one of those streets, barely wide enough for a single car, is the ultra-modern and unconventional DuoMo Hotel designed by architect Ron Arad. The reception desk (shown) is a stainless steel ring attached to a polished steel column. Each of the high-tech rooms has a bathroom pod with slatted teak floors.